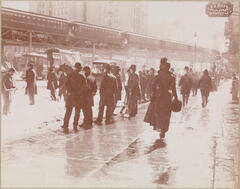 Museum of the City of New York - Herald Square, About 1900. Herald Square with men lining the curb and a woman walking away from the camera; the elelvated subway is passing on the tracks overhead. E. H. Gato Cigar Co.